Here is a great way each of you can donate $20 to the Fair Grove Senior Center without spending a dime. Bank of Bolivar (aka BOB) has a promotion going on from now through December. Anyone opening a CD or deposit account in November or December with BOB will have a choice of four non-profit organizations to receive $20. You will also receive a small gift. There are no strings attached. The $20 is NOT taken out of your account. It’s BOB’s way of giving back to the communities they serve. We are BOB’s Fair Grove non-profit choice this year. The new building will allow us to serve seniors all day long five days a week. With the exception of election days, for the last eight years, the Fair Grove United Methodist Church has offered their Fellowship Hall each Tuesday for our use. When we move to the new building our services to seniors will expand greatly. As a bonus, the facility can be used after hours or on weekends by others–think wedding receptions or family reunions for example. Except for siding on the front, the new building looks complete and so does the property. We have worked for several years to get to this point. With the help of many people and organizations–including BOB in the past–we are close to being fully funded. The money we raised has only covered the cost of the building itself. Little did we realize when we put together our funding, how much more we would have to spend outside the building. City regulations required us to pave the parking lot, landscape the grounds, install a detention pond to catch water runoff, etc. We took out a construction loan to cover those costs, but of course, we must raise money to pay off that loan. This is your opportunity to help. 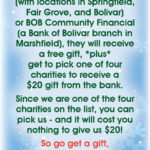 Simply go to one of BOB’s locations, setup a new account and PICK US as your non-profit to receive the $20. You might think your $20 donation won’t make a difference, but the last time we were BOB’s Fair Grove non-profit choice, they gave us a check for $880. Click on image below to see details.